Our stylist Peyton Baxter styled Virginia Holladay’s senior photo shoot to stand out. We had several amazing locations – and the most beautiful subject – so the wardrobe had to be stellar! Peyton and Virginia were the perfect pair. Their outfit selections did not disappoint. 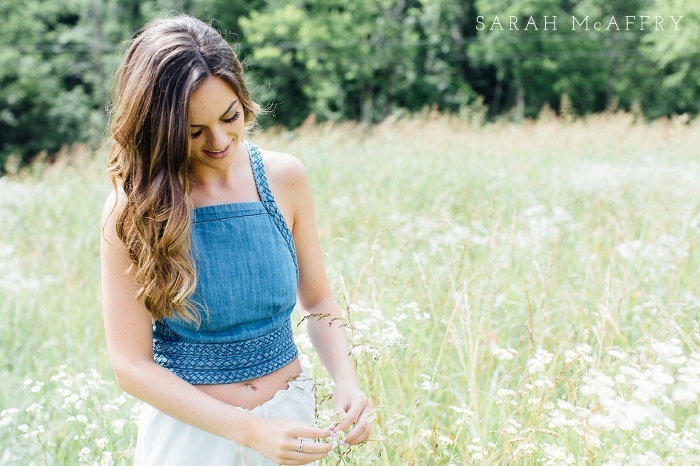 Here are five outfits to inspire you as you plan for your portrait session, or just for a fun summer wardrobe! The flowy white linen pants were the perfect blank canvas to pair with this braided denim crop top from Anthropologie. Has there ever been a cuter shirt in the history of shirts? It kind of makes me wish I was 17 again. My favorite thing about this top is that while it is certainly trendy, the denim fabric gives it a timeless appeal. Our second location for Virginia’s shoot was the historic Church Street United Methodist Church in downtown Knoxville. That kind of location calls for a classic and modest dress, so this peachy color dress with a subtle blue print was a great pairing. It’s a classic look and made the perfect pick for the canvas that will hang on their walls forever. Virginia snagged this black top from Topshop in London a while back, so we had to find a way to incorporate it. I love photographing sentimental pieces, whether it’s a piece of jewelry passed down from generations before or just a fun fashionista shirt from a special trip. She searched high and low for these shorts, and I’m so glad she did. It was worth it for this shot alone. This was her more fashion forward look, and she looks like she walked right out of the pages of a magazine. This blue and white seersucker off-the-shoulder top is somehow timeless and trendy at the same time. I encourage my clients to do one off-the-shoulder look in their session. There’s something about it that is so elegant and feminine, plus it’s great for all body types. The delicate ruffle on the pocket and waist of the shorts gives another subtle feminine touch. A photo shoot is always a great reason to shop for new clothes, but I love photographing my clients in their everyday wear too. This denim skirt and white tank is one of Virginia’s go to outfits, so these pictures look like the real, everyday Virginia. Whether it’s skinnies and Chucks or ripped up shorts and a tank, you’ve got to add in one casual, everyday outfit.